Some years ago, when I started working from my studio flat to my current employer, I ate nothing but frozen pizza margaritas with some added extra Finnish blue cheese for a week. I was fairly busy, stressed out and didn’t have an inspiration to cook for myself anything elaborate. I mentioned the problem of my bad dinner habits to a coworker who asked me a question: “Why don’t you try texmex burritos?” I’ve loved Mexican ever since my sister introduced me to it in the early 90’s in California, and I quickly saw the benefits of the idea. I’ve cooked countless amounts of them to force me to eat veg and meat instead of just frozen pizzas and pasta with cheese. Fry the meat, add the seasoning. 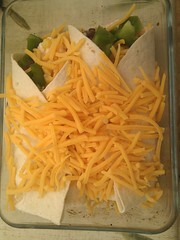 Warm up the tortillas lightly on a pan or microwave them soft, assemble with the meat and other ingredients. I fold my tortillas to burritos to have a bottom in a way that looks a bit like an envelope, so I try not to put too much filling in. Cottage cheese, soured cream and guacamole (depending on how spicy it is) work as a nice cooling agent and the optional beans or sweetcorn adds a bit bulk. The brilliance of this food comes on the leftovers. From 400g of meat you get 4-8 burritos, depending on how much of the other stuff you put in. Single person eats from this 2-4 meals, with minimal work, very little pot washing and a possibility for endless modifications. I’ve had this in different ways three times this week. To finish the leftovers today, I decided to try out our new inverter microwave oven a bit more and filled my tortillas with the seasoned beef strips, cottage cheese, sweetcorn, green peppers and grated cheese. 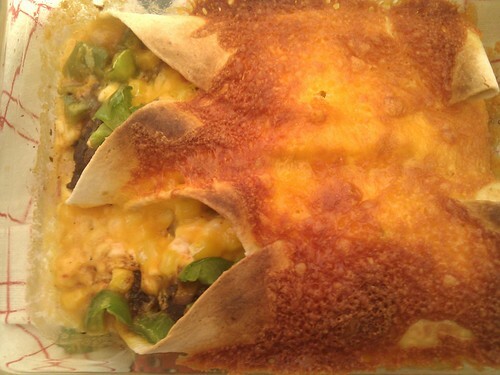 I then folded the tortillas to burritos, placed them in a microwave proof dish, poked a piece of linguine to keep the burritos folded (as I couldn’t find toothpicks) and just because there can never be too much cheese, sprinkled some on. Five minutes in our miracle microwave on combined grill/medium microwave and end came out a wonderful dish. Served with an extra large heap of salad, this was the best dinner of this week. A type of food we love is Thai. It’s quite a lot different from other Asian cuisines popular in the UK because there’s a lot more variation in tastes and flavours, which makes them extremely fragrant and colourful. Thai curries and soups are pretty much the only thing I can cook pretty well without looking at the recipe every step of the way. 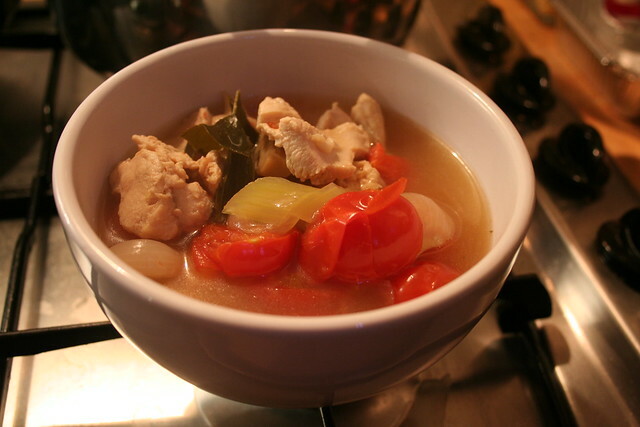 Something we cook regularly is Tom Yum Gai, a spicy chicken soup with a fragrant citrusy taste. As we’ve eaten this in a lot of restaurants as well as cooking it with many tweaks, we’re constantly varying the ingredients and quantities based on the flavours and textures we fancy at the time, but I’ll describe the most common version we make, with some notes of tweaks you might want to try. 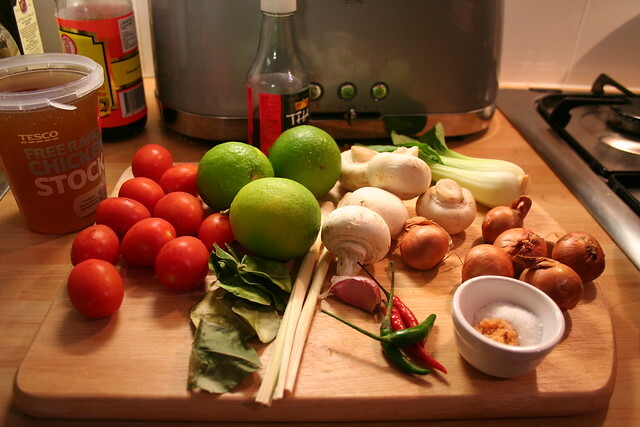 The recipe we based ours on is from Temple of Thai, which is a wonderful site for anyone keen on cooking thai dishes. Shallots – Add at the second phase of cooking (along with the tomatoes) to stop them going too soft. I’d suggest getting the longer ‘french’ variety rather than the small round ones. Spring onion – Add at the second phase or at the end of cooking. One thing to note is that it can get confusing to notice which bits are spring onion and which are lemongrass. There are 2 simple phases to cooking this soup. The first involves boiling the chicken stock and adding the chicken, as well as all of the ingredients other than the tomatoes and chillies, then simmering for 10 minutes. 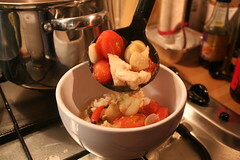 Then add the other ingredients (vegetables that don’t need much boiling) and simmer for another 5 minutes. The recipe says to simmer without a lid, but the choice is yours. That’s it, very simple… throw it all into a pot and leave it. 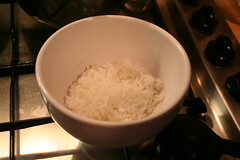 If you cook some Jasmine rice at the same time, it adds a great texture and makes the soup more substantial if you’re having it as a main course, as we usually do. Just put some in the bowl before you dish out the soup.